Greece’s creditors have agreed to press the country for additional austerity measures if it falls short of budget targets, a move that papers over disagreements between the lenders but could test the stability of Greece’s fragile government. European Union institutions and the International Monetary Fund are set to resume talks in Athens on Tuesday and Wednesday after reaching a deal among themselves in Washington at the weekend. The IMF and the EU’s executive arm, the European Commission, agreed to reconcile their differing views on Greece’s budget outlook by demanding an extra austerity package of about 2% of Greece’s gross domestic product, or €3.6 billion ($4.1 billion). The package would be triggered only if Greece falls short of targets over the next three years. 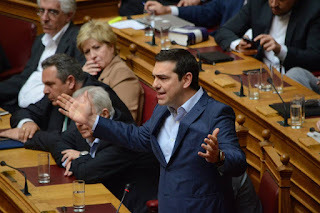 But the proposals, which come on top of a list of austerity measures already being negotiated, would have to be passed into law now—posing a stiff test for the governing coalition of Prime Minister Alexis Tsipras, which has a majority of only three seats in parliament. Greek officials are resigned to having to sign up to the full set of budget cuts, totaling around €8 billion. They are hoping that in return, creditors will give Greece a concrete promise of major debt relief, a political prize that could help Mr. Tsipras sell unpopular belt-tightening.